Discussion in 'The Lounge' started by BigMike, Mar 26, 2008. Very cool. Someone email him and ask him to put a the monkey logo on one. Wouldn't a graffitti "artist" just paint the billboard? You obviously have no appreciation for "art". No, bro, they totally pwned Clear Channel, they just used, y'know, money instead of mad keyboard skillz. 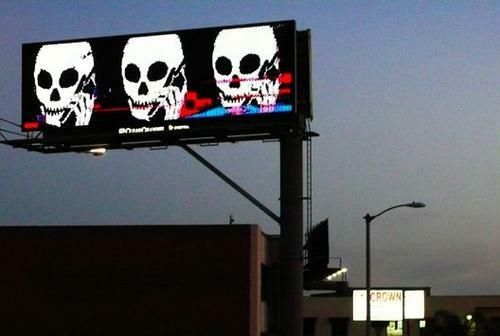 Who would pay a whole lot of money to make people THINK they hacked billboards? Oh well, it's hard to master both grafitti and Linux. CC would..Perhaps its corporate propaganda aimed at cutting him off at the knees? I need real proof. I dont trust CC. Who'd waste the time on the big fat loser? Oh, I wouldn't hold it above the people posting these signs and fliers everywhere. It's annoying.